Several years back, after reviewing a box of postcards devoted to selected Marvel Comics covers, wondered why there wasn’t a DC Comics equivalent. 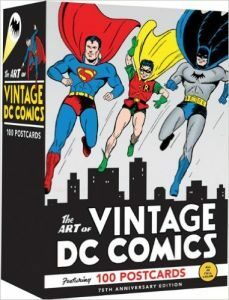 With ‘The Art Of Vintage DC Comics: 75th Anniversary Edition’ you have this version of postcards. The most obvious thing you will want to know is what is inside the sealed box, so without further ado, here is the list with comments where needed along the side spread across the decades. As you can tell, there is a wide spread of titles covered and I was particularly surprised how many Wonder Woman had in proportion to the others, especially as she’s not featured on the box cover. Selecting them must have been difficult but there are odd omissions, like the absence of ‘Superman’s Pal, Jimmy Olsen’, the horror titles or even ‘Ambush Bug’ and ‘’Mazing Man’, just for some comedy cards. Considering how successful ‘The Titans’ and ‘Legion Of Super-Heroes’ were, one card each does tend to reduce their influence over the decades. On the back of each card there is a small caption detailing who drew the cover. Much of the emphasis is on first appearances although as you can see from some numbering that isn’t always true. The cards are in alphabetical order and although I don’t know if it will be true of all sets, two of the cards weren’t in numerical order. That should drive some of you crazy to find out whether it holds true for all boxsets so be careful when you look through them. Although I doubt if you buy a box that you will use them for the purpose intended, as a collector, you will undoubtedly want a set in your collection. It’ll be up to you as to whether you keep them in this decent box or put them in plastic display sleeves. One can only hope that Chronicle might consider doing sets of cards for particular comic series because I’m sure there would be enough fans out there who would see this as a convenient way to look through to identify the comic they want to pick out of their collection. I love postcards. Small scale artwork. And even though I wasn’t a huge comic book fan as a child I did love my cartoons. I think these would make great framed artwork for any young person’s or collector’s room.